Today we present you the top five best smartphones that money can buy currently on the market, so if you are thinking about replacing that old smartphone you have, consider one of these on our list. If you want to get a smartphone including the latest cutting edge tech, then you should definitely look at our top five picks. We got you covered. Here you go for those in a rush. These days the best smartphone currently available on the market is definitely Samsung S8 that definitely breaks through some boundaries offering everything you would expect in a smartphone. The smartphone was announced back in Mart and released in April of 2017. Samsung Galaxy S8 is definitely the best smartphone you can purchase these days featuring an amazing design, flawless performances, and fingerprint sensor location while boasting that brilliant Infinity Edge display that occupies eighty-percent of the body. Samsung Galaxy S8 is absolutely a futuristic smartphone that instantly made its competition look pretty much dated. It is the industry-leading with an amazing battery life, excellent camera so when you combine it you get not only the top performance, but the best-looking smartphone currently on the market. Second on our list is an amazing high-tech smartphone manufactured by Apple. Inc, Apple iPhone 8 Plus. The smartphone, in fact, is the superlative phone with an amazing camera, excellent performance, and futuristic appearance. It was released in September 2017, and everyone was very excited to meet this newest member of iPhone family. Therefore, the smartphone is best from Apple currently available featuring heaps of amazing power for slick performance, excellent camera, water-resistant body and much more. When it comes to the camera, the smartphone features a big improvement in comparison to its brother iPhone 7 Plus. It is also an improvement in battery life and power usage. This bigger version of Apple iPhone 8 features an innovative camera and better battery life, so it definitely deserves this high second place on our list. Third on our list is an amazing smartphone manufactured by tech giant Samsung, Samsung Galaxy Note 8 which has it all when it comes to the performance, appearance, and power. It simply retakes the throne being ahead of its competition by many aspects just like its brother Samsung Galaxy S8. It is pricey, but it does it all. Even though it is released recently in September of 2017, it deserves this high third place. The smartphone features an iterative design, dual camera, gorgeous resistant design and pretty much everything else needed for an ultimate experience. It is probably the best-looking smartphone currently on the market, even though due to its size it may be tricky to hold it. If you are interested in purchasing the fanciest smartphone, then you should definitely consider purchasing Samsung Galaxy Note 8. 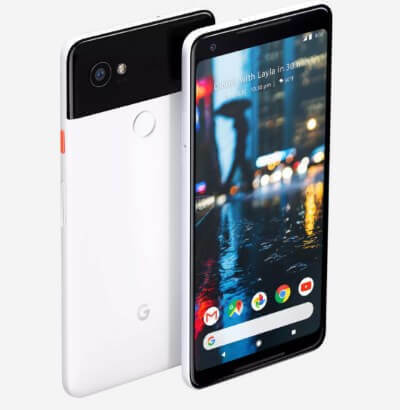 If you are looking for a smartphone with the best camera, then your safest pick is definitely Google Pixel 2 XL. It is the smartphone manufactured by Google. It will be released in October of 2017 featuring everything you are looking for in a smartphone, amazing performance and slick design. The smartphone also features super software so it was really close between this smartphone and its competition, but still, it made it to the high fourth place on our list. If you prioritize camera quality and you want amazing software straight from Google that this is a smartphone for you. It should be noted that virtual assistant and software work in perfect harmony with the futuristic hardware since Google really got everything right in this smartphone. This one is also great if you prefer larger screens. LG finally surprised us since the company finally made an amazingly good-looking and premium smartphone with amazing features we like that wide-angle screen, tiny bezels, and excellent dual cameras. This phone, in fact, is the first of the bezel-less phone featuring an excellent performance even though it is less premium than its competition, it definitely deserves to be placed on our list. LG most certainly has done more than enough in order to redeem itself when it comes to the pretty much unsuccessful LG G5 released last year. The smartphone is a more successful brother of G5 featuring futuristic design, slick performance, and an amazing battery life. It should be noted that the phone is less expensive than its premium competition, which makes it a perfect choice for those who want to save some money without compromising on quality and features.